In a devastating conclusion, there were hold-ups ‘securing a conveyance’ to take the gravely injured hero to Waikato Hospital where he died a few hours later. The public lined Victoria Street and stood in silence while his funeral cortege passed escorted by returned soldiers to the railway station for his return to Auckland. There he was given a military funeral and burial beside his daughter Norma at Purewa Cemetery. 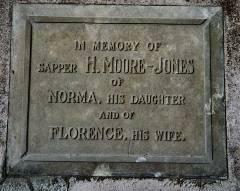 Horace Moore-Jones, soldier, artist and teacher, a hero of Hamilton. “As the sad cortege passed through Victoria Street yesterday afternoon the thought struck more than one onlooker (apart from the knowledge of the deplorable sad disaster that happened in our midst) that common respect should have urged the general public and the drivers of vehicles to stand just a few short minutes, and that business people (who knew of the arrangements) would have closed their doors during the passing of the motor which carried the remains of the gallant Anzac who lost his life in such a tragic manner in helping to save others. 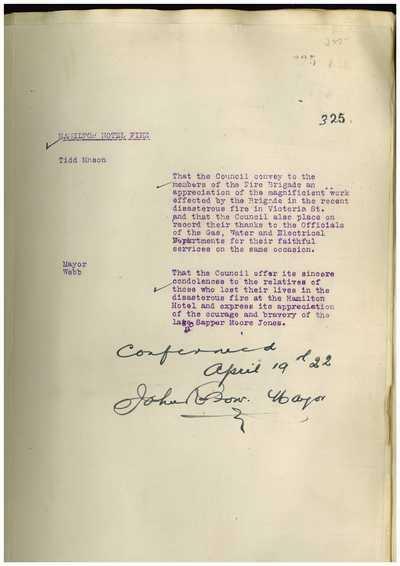 Horace Moore-Jones was formally recognised at the next Hamilton Borough Council meeting, and councillors also acknowledged the Fire Brigade and their council staff for their response to the disastrous fire. “The deceased, in endeavouring to do his best for others, had given his own life. It was a glorious end to a life which had all along been conducted on the same lines and was quite in accord with the high principles on which the deceased had acted. The deceased will always be remembered by his Gallipoli war pictures… After the evacuation the artist elaborated them and exhibited them in England, where they attracted great attention and won golden encomiums. After the armistice the artist brought them to New Zealand, and the sensation was repeated. Gallipoli holds sorrowful associations to many New Zealanders, and relatives of our ‘diggers’ flocked in thousands to see the pictures and sketches of the places that had become household words. The artist offered the collection to the New Zealand government, but Massey and Co. turned the offer down, despite the strong representations that were made. Apart from the high artistic merit of the works, there was their great historic value, and this would have increased with the years. Thus, apart from sentimental reasons the purchase of the pictures would have been “good business” for the Government. But no. Our severely materialistic Government, not having a soul above butterfat and such mundane things, would not unbutton….